The first tattoo in the air was done in conjunction with a parachute jump was made in the air above Everöds airfield outside Kristianstad in Sweden. The tattoo consists of the four letters WFFT which freely translated means the world’s first frifallstatuering. The idea for the adventure was perhaps not as a godsend, but by a crazy whim. 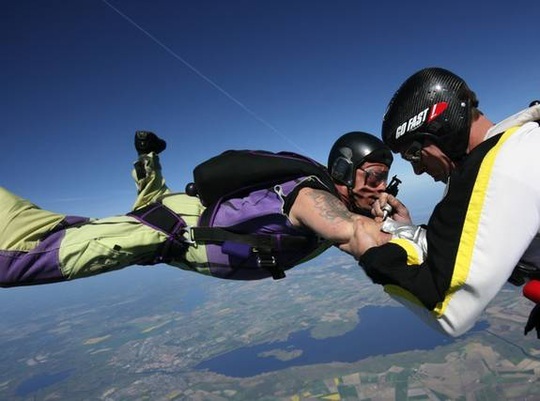 – I am both tattoo artists and skydivers and figured I could kill two birds with one stone, says Jonas Rogerstam with approximately 2300 jumps under my belt. The main difference between a painting in the air and on the ground is enough time, think Jonas. – Up there, we have a minute on us. But the plan was and the historical tattoo is thus on the 39-year-old Christopher ”Poffe” Nordin’s right arm. – I invited him on it, he is the host because he stood up, says Jonas, easy lyric. – There is so much that needs to run smoothly and it really made it that day with the weather and everything, says Jonas Rogerstam. – I work as a tattoo artist and skydiving, so why not combine the two most amazing things. – I will have the machine connected to a battery that powers it. Then we will jump from 5000 meters and there are no tandem jumps. I have just under a minute on me to do the tattoo. How did you get with your friend? – He himself is interested in tattoos, skydiving and is somewhat crazy, so it was no problem. What will you get a tattoo? – It is not quite decided yet, but it will probably be a little parachute guy on the right upper arm. – It is the color runs out. So much so, I trust my knowledge. I’ve done 2,300 jumps and has Christoffer too.